Correctly installed windows operate smoothly and efficiently. A fully functional window can boost your home’s curb appeal and energy efficiency. Working with a fly-by-night installer instead of a licensed contractor for your window replacement can, however, result in costly repairs or premature replacement. Renewal by Andersen® of St. Louis, a premier windows installation company in the area, shares four telltale signs of poorly installed windows. There’s no excuse for windows that don’t fit, most especially when you paid a contractor to finish the job for you. Incorrect window measurements can create gaps between the frame and sill or wall. This can compromise your windows’ ability to be airtight, which, in turn, reduces your home’s energy efficiency. Your casement windows are part of your home’s thermal envelope; they help keep your living space cozy all year round. Poorly installed windows, however, can cause drafts and lead to a sharp increase in your utility bills. In fact, drafty windows can result in a 10% to 15% increase in your energy bills. Water has a way of seeping through even the tiniest holes, which is why you need to have perfectly fitted windows. Fortunately, Renewal by Andersen provides custom-built replacement windows based on the existing wall openings of your home. This prevents window leaks that can damage other components of your interior space. Your new windows must smoothly open and close. There’s no reason for it to squeak or get stuck unless it’s improperly installed. Hard-to-operate windows often have a sash that is slightly smaller or bigger than the rest of the window. 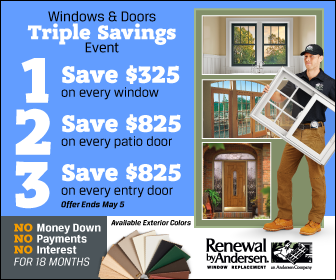 At Renewal by Andersen of St. Louis, we install energy-efficient windows to help drive your utility costs down. Call us today at (314) 332-2364 to learn more about our products and services. We serve residents of Missouri, including St Charles.